The holidays are a great time to make candy. It’s perfect weather to be in the kitchen, and there are all kinds of great treats to make—plus lots of occasions on which to share them. Whether you’re participating in a holiday cookie exchange, making homemade edible gifts or simply adding them to the Christmas dessert table, here are great Christmas candy tips—along with goof-proof recipes and videos for making fudge, truffles and easy chocolate cookie bark. Sweet treats make great gifts. Try chocolate bark for an easy option that makes you look like a pro. Chocolate Cookie Bark, Pretzel Bark, BAKER’S ONE BOWL Cranberry Bark, BAKER’S Chocolate Holiday Bark and Holiday Jewel Bark are just a few of the possibilities. Once the candies have cooled, simply break them up into striking shards. A tissue-lined box or tin makes for a pretty presentation. Or, place shards in a glass jar, and tie with a festive ribbon and holiday note. Another fun gift idea is the BAKER’S Chocolate-Dipped Spoon. Just melt 2 pkg. (4 oz. each) BAKER'S Semi-Sweet Chocolate or 2 pkg. (4 oz. each) BAKER'S GERMAN'S Sweet Chocolate as directed on package. 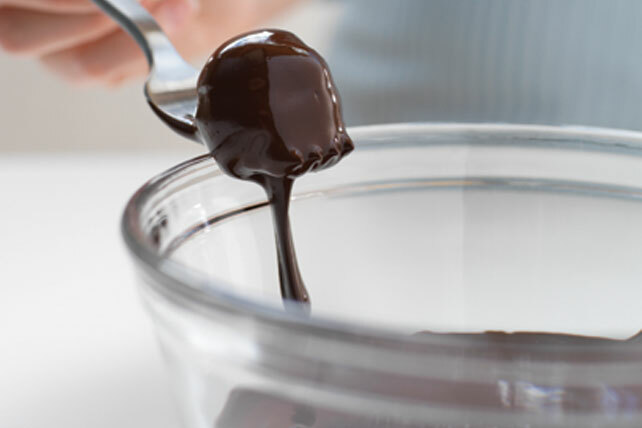 Dip clean, dry plastic teaspoons into melted chocolate to coat the bowls of the spoons; let excess chocolate drip off. Place in single layer in waxed paper-lined tray; refrigerate 10 min. or until chocolate is firm. Cover tray with plastic wrap. (Or wrap spoons individually with plastic wrap and tie ribbon around each to secure.) Store in refrigerator until ready to use. The holidays just wouldn’t be complete without a Gingerbread Holiday House. This is a great project to do with the kids on a blustery winter day. And the best part? It requires no baking – just plenty of creativity! Making toffee can be a challenge for even the most well-versed candy maker. Why not try Graham Break-Aways instead? The recipe requires no candy thermometer, and the finished product is reminiscent of the finest toffee. It’s great for gift-giving, as well! If you prefer white chocolate, try White Christmas Crunch Squares, featuring BAKER’S White Chocolate and crushed candy canes. Fudge is a favorite during the holidays, and there’s a good reason for that. It makes a great gift for young and old, and the flavor varieties are endless. If you have never made fudge before, check out this Easy as Fudge video for some fudge basics. Then explore these options to find your favorite: Fantasy Fudge, Layered Chocolate-Peanut Butter Fudge, Easy Chocolate Fudge and Truffle Fudge. When you purchase BAKER’S Chocolate this holiday season, keep in mind how to store it properly. Store chocolate in a cool dry place (below 75°F), but not in the refrigerator. At higher temperatures, chocolate grays in color when the cocoa butter naturally rises to the surface. This color change, however, doesn't affect the chocolate's flavor or quality. If your recipe calls for melted BAKER’S Chocolate, follow this simple method for success every time: Microwave 1 oz. of BAKER'S Chocolate in microwaveable bowl on HIGH for 1 min. or until chocolate is almost melted., stirring after 30 sec. (The square will retain its shape.) Stir 1 min. or until chocolate is completely melted. Add 10 sec. for each additional ounce of chocolate, stirring every 30 sec. Hosting a holiday party? Consider using truffles, cookie balls or cookie pops as party favors. There are a variety of flavor combinations to suit your preferences or party theme. The Simply Sensational Truffles recipe comes complete with a video on the basics of truffle making! Or check out these other possibilities for your party: Black Tie Truffles, Reindeer Cookie Ball Pops, Melting Snowmen Cookie Balls and Chocolate Rum Balls. And watch our helpful Cookie Ball How-to video for more tips on making these popular treats. Peppermint and chocolate taste great together. To create your own chocolate-dipped candy canes, follow these simple instructions: Heat 1 tub (7 oz.) of your favorite BAKER'S Dipping Chocolate as directed on package. Dip bottom half of each candy cane or peppermint stick into chocolate. Gently shake off excess chocolate. Refrigerate candy canes or peppermint sticks until chocolate is firm. Refrigerate any remaining dipping chocolate. Once chocolate coating is firm, remove dipped candy canes or peppermint sticks from refrigerator. Store, covered, in cool dry place. One dipped candy cane or peppermint stick makes 1 serving. Enjoy it on its own or use as a stirrer for hot chocolate.